"The BEST burritos come from La Cumbre!!!" That's a pretty bold statement! But since I heard it both from the Travel Channel (Man vs. Food) and from a number of on-line reviews, I had to put it on my list of places to check out in SF. I needed to know for myself what all of the rave was about. 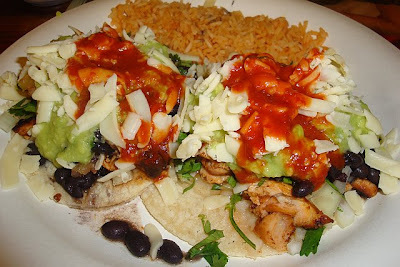 Taqueria La Cumbre is located in the Mission District of San Francisco (515 Valencia St), the neighborhood in SF to head to for excellent Mexican food. According to their menu, La Cumbre was the first taqueria in San Francisco. All things that would make you think you would sink your teeth into the BEST burrito in your life, right? 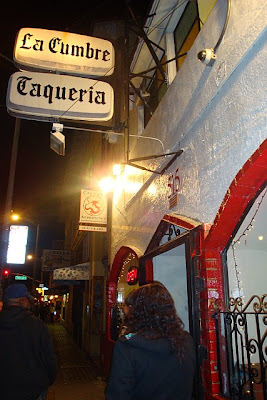 (More about that in a moment) Taqueria La Cumbre is open seven days a week from 11 a.m.-2 a.m., so it's a convenient place to head to after you hit the bars in the Mission. Inside, Taqueria La Cumbre is decent, definitely clean and well cared for. The decor is simple. 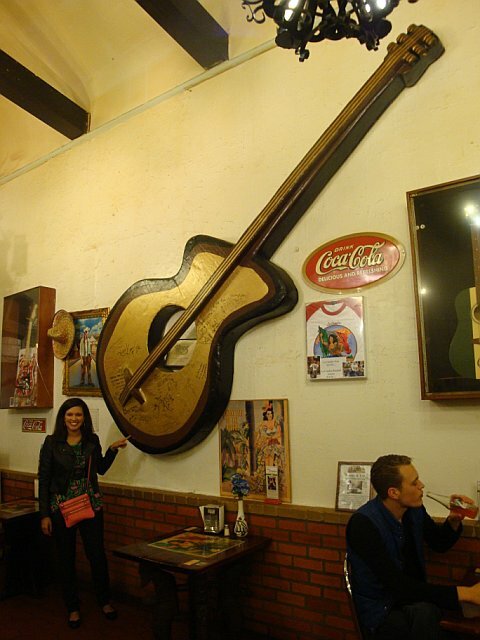 (Loved this huge guitar hanging on the wall :-) So I went ahead an ordered a chicken burrito. I loaded it up with the goodies...salsa, cheese, rice, black beans, guacamole, etc. There’s even a salsa bar offering at least six different salsas and a number of fresh vegetables, including corn, radish, cilantro, onion and pickled peppers and juicy lime wedges. So look at my masterpiece when I was done with all of the fixings...looks good, huh? Now for the moment of truth...DISAPPOINTING!!! I think this place may be overrated because it was on the Travel Channel. I would say the burrito was the. absolute. blandest. burrito. i have EVER had!!! Oh, La Cumbre! How you disappointed me! I have heard that the carne asada deluxe burrito may be better (after you add sour cream, guacamole and hot sauce to it), but I don't know if I would believe it. What happened to eating the "BEST burrito ever???" If you're in the Mission and want good Mexican, the locals tell me to head to Pancho Villa or La Corneta instead!